(MissionNewswire) The Alliance for Global Food Security is opposed to current reforms proposed in President Obama’s “Food Aid Reforms” presented in the Fiscal Year 2014 Budget Proposal. Instead, the Alliance supports greater flexibility and efficiency in food aid programs that maximize benefits without jeopardizing the availability of food aid and has put forth a set of recommended changes that would achieve these purposes. The President’s proposal would eliminate funding for Food for Peace and Food for Progress programs. Further, it would transfer $1 billion of Title II funds to the International Disaster Assistance Account for local/regional procurement, US commodity procurement and cash transfers to local populations during emergencies and transfer about $200 million to the Development Assistance Account to support a “Community Reliance and Development Fund” that would provide assistance to chronically hungry and poor communities, but would not provide food aid. Lastly, it would create a $75 million contingency fund for emergencies and provide $25 million to a maritime-related program as a partial offset for decreased use of US-flag vessels to carry food aid cargoes. These proposed changes amount to less funding and less flexibility than what is available in food aid today. The Alliance for Global Food Security, made up of partners from private voluntary organizations and cooperatives including Salesian Missions, believe the stakes in food aid reform are very high since the proposed reforms will affect the lives of millions of vulnerable people around the globe. “Improvements and containing costs are necessary, but we must remember that the United States has the most comprehensive, transparent and responsive food aid system in the word,” says Ellen Levinson, executive director of the Alliance for Global Food Security. The Alliance therefore recommends a three-pronged approach: maintain funding for Food for Peace and improve procurement and the approach to monetization under that program; use International Disaster Assistance funds for local and regional procurement, cash transfers and food vouchers; and fund a “Developmental Local-Regional Purchase Program” to build the capacity of small farmers and processors in food insecure areas of the developing world to improve the quality, safety and quantity of food aid for local programs. Further details are provided in a briefing paper that has been made available. The Alliance points out that there is flexibility now to increase the amount of USAID disaster assistance funds used for local-regional procurement, cash transfers and food vouchers during food crises. Despite the difficult budget climate, the amount used for those purposes increased from $232 million in FY 2011 to $375 million in FY 2012. However, local procurement and cash distribution for food crises are not necessarily less costly than providing U.S. commodities. 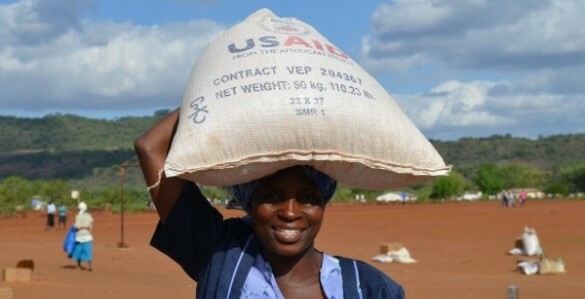 In FY 2012, the USAID programs cost an average of $2,836 per metric ton, compared to $1,188 per metric ton for emergency Food for Peace Title II food aid. Moreover, the Alliance notes that the types and amounts of commodities available are typically limited in areas where food crises occur. “Add to that poverty, poor infrastructure and recurring cycles of floods and droughts and it becomes sadly apparent why one out of every seven people has too little to eat,” concludes Levinson. Alliance members are committed to addressing hunger, malnutrition and food insecurity. They operate in over 100 developing countries implementing emergency and development programs that build the capacity of local communities, enterprises and institutions. Salesian Missions, the U.S. development arm of the Salesians of Don Bosco, is one of 14 partners in the Alliance for Global Food Security. For further information, please see FoodAid.org. The Alliance for Global Food Security is made up of private voluntary organizations and cooperatives–including Salesian Missions) which are committed to addressing hunger, malnutrition and food insecurity through the effective and accountable use of food aid and other resources in programs that are conducted in partnership with and improve the food security and nutrition of poor and vulnerable populations. The Alliance seeks the adoption of responsible governmental policies and programs and the provision of adequate resources to achieve this goal.